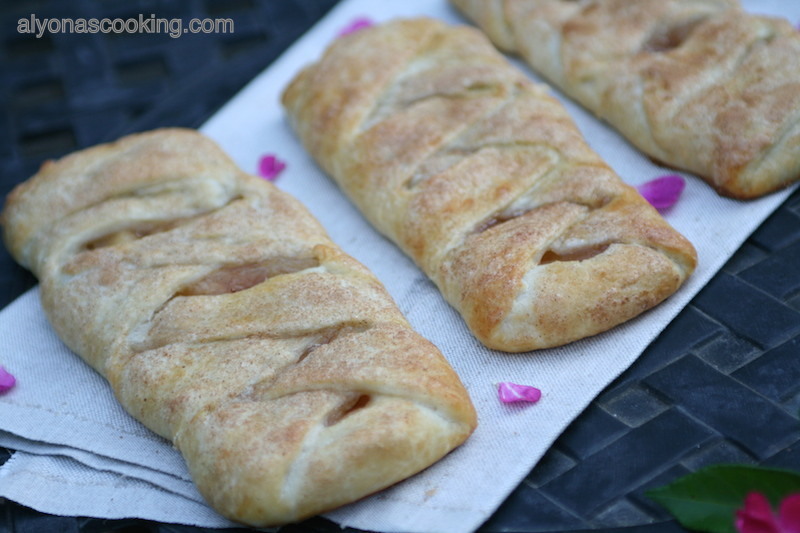 I was inspired to make these little apple pie braids from a Dunkin Donut Pastry that was very similar. 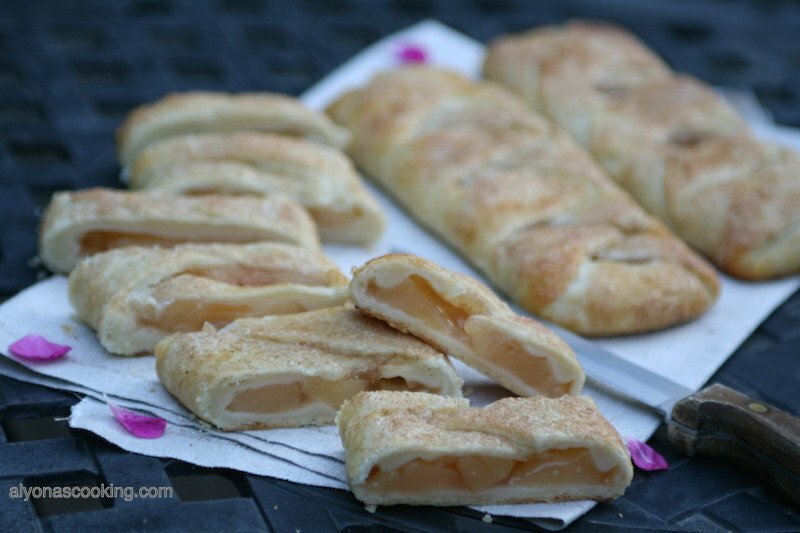 These apple pie treats are great if you don’t feel like making a big pie with a lot of filling in one slice. Not only do these braids look pretty but there just as good as a classic apple pie just in a slightly different form. My friend had brought little mini apple braids from Dunkin Donuts for breakfast one morning and I was impressed by that little dessert. 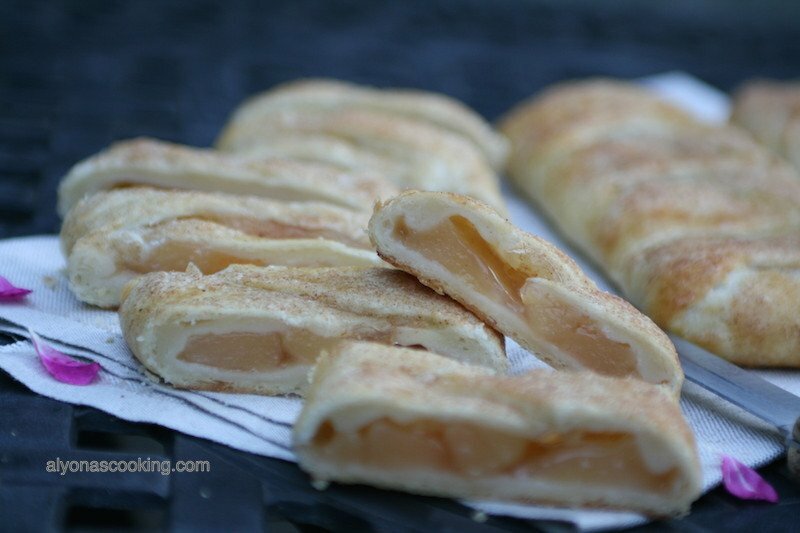 The pastry seemed to be like a flaky pie crust dough with an apple filling and cinnamon sugar crusted top. 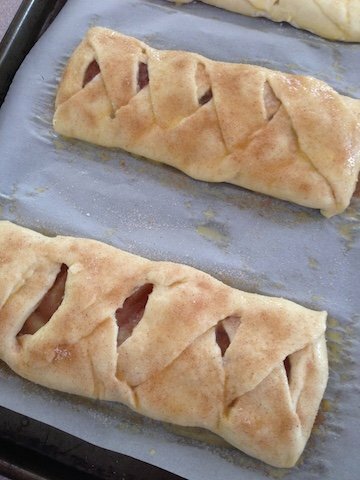 I tried to recreate those little pastries from homemade dough and use canned apple pie filling. Im quite happy with the results, although they don’t look identical to the Dunkin version (is way smaller) but at least they taste just as good. Maybe one day I’ll create mini ones but for now these well work. My Little Apple Pie Braids dough recipe requires some refrigerating time but the recipe itself is very easy and simple to follow. 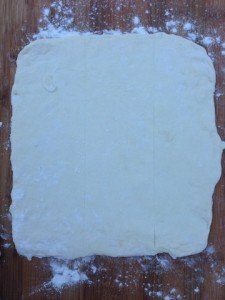 I highly recommend making the dough the night before you want to make these pastries, as that helps with the rolling out process. 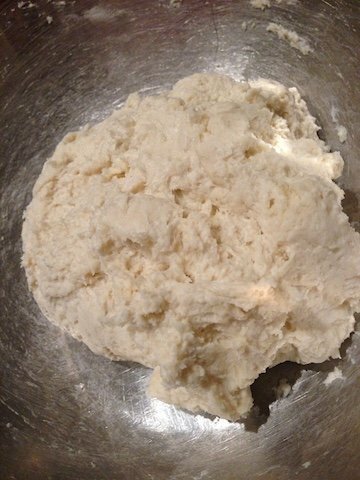 Refrigerating also helps with the flakiness of the dough so please be patient and take the time to chill before baking. 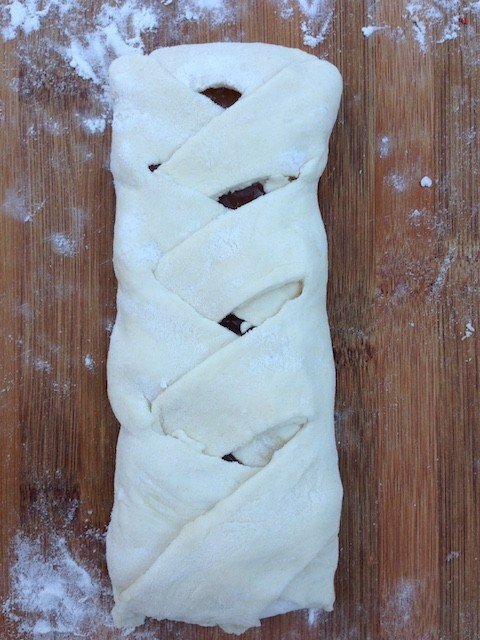 This recipe makes three little 8″ braids, but I’ll have to say there’s really nothing that compares to homemade pastry dough, so don’t be intimated by making your own. It’s really not that complicated. So take out some butter and flour and let’s begin! 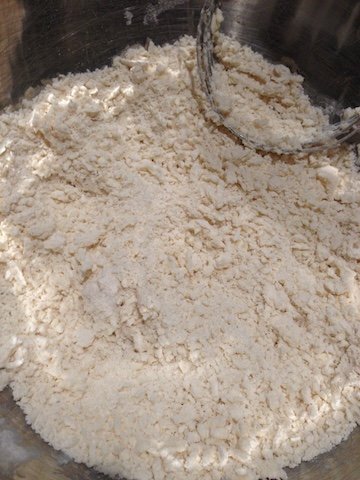 In a large bowl combine the flour and salt. 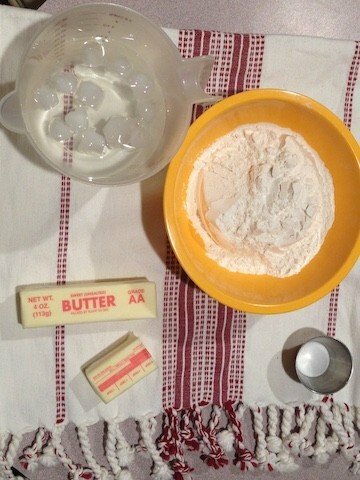 Grate cold butter into the flour and cut butter in the flour using a pastry cutter, until coarse meal resembles. Add ice cold water to the flour and stir with a wooden spoon until combined. (Do not add ice cubes to the flour we only want ice cold water.) Cover and refrigerate dough overnight. After the dough has chilled over night; remove and form into a 8′ by 4″ rectangle. Cut into three equal pieces (each about 2 1/2″ wide). Roll out each piece into a 9″ by 9″ square, working with one piece at a time. Very lightly mark the square into three equal lines going down (each strip should be about 3″ apart. Do not cut through we are just marking the dough with a knife for even braids. 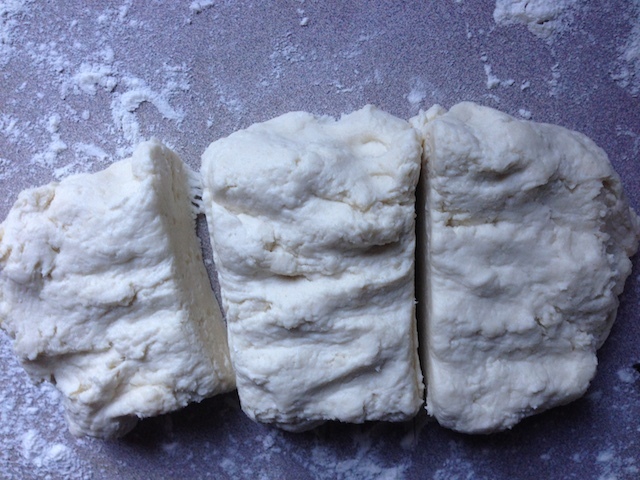 Remove the four outer corners of the dough. 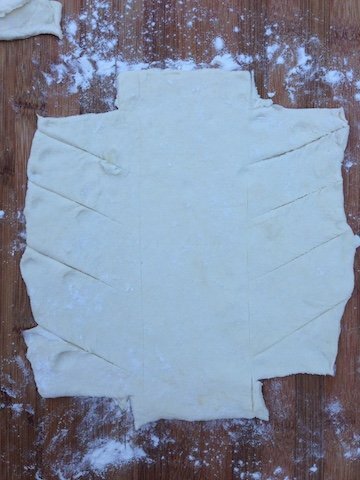 Cut the sides of the dough making slanted lines. Do not go in to far with a knife only cut the outer part of the dough. 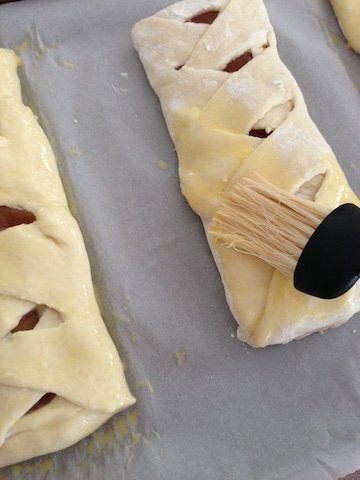 Fold in the outer flaps towards the filling and pinch down corners to seal. 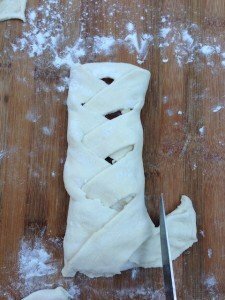 Bring strips over the filling one at a time alternating left to right to form a braided pastry, pinching ends into the dough to seal. 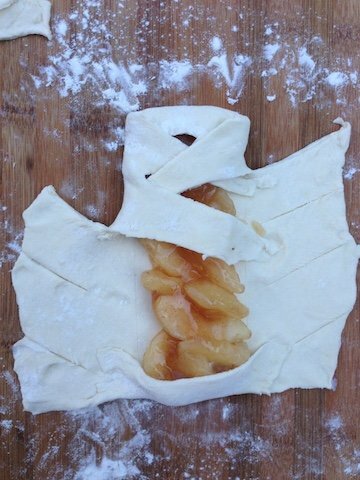 Trim off any excess pieces and pinch dough down to seal any openings. Slightly flatten and shape into an even braid. Place onto a floured tray and refrigerate braids at least 2 hours before baking. After dough has slightly chilled, preheat oven to 375 degrees F. Beat 1 egg and 2 tsp of water in a small bowl to make egg wash. Brush braids with egg wash. 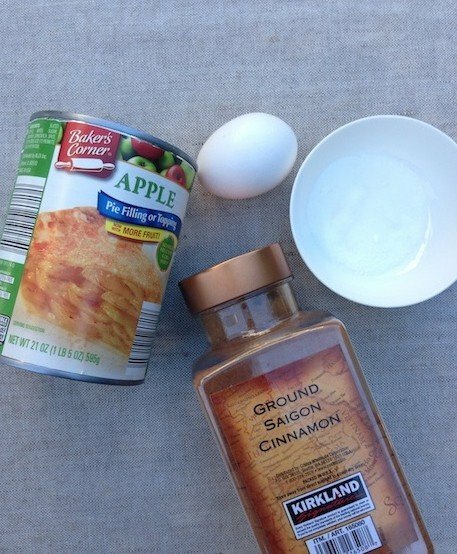 Combine 1/4 cup of granulated sugar and 1/4 tsp of ground cinnamon in a small bowl. Sprinkle over braids that have been brushed with egg wash. Allow braids to sit for about 10 min before placing in the oven. Bake for 20-30 minutes in the preheated oven. 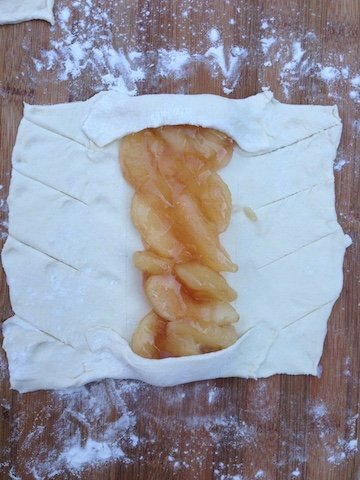 I was inspired to make these little apple pie braids from a Dunkin Donut Pastry that was very similar. 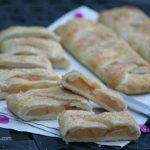 These apple pie treats are great if you don't feel like making a big pie with a lot of filling in one slice. Not only do these braids look pretty but there just as good as a classic apple pie just in a slightly different form. Add ice cold water to the flour and stir with a wooden spoon until combined. Cover and refrigerate dough overnight. After the dough has chilled over night; remove and form into a 8' by 4" rectangle. Cut into three equal pieces (each about 2 1/2" wide). Roll out each piece into a 9" by 9" square, working with one piece at a time. Very lightly mark the square into three equal lines going down (each strip should be about 3" apart. Do not cut through we are just marking the dough with a knife for even braids. Remove the four outer corners of the dough. Oh I’m so glad I found this dough recipe. I like anything filled with apples. Going to try this as soon as I buy some butter (baked yesterday and ran out:). Your recipes look good, I just found your blog, usually use Natashaskitchen or olgasflavorfactory.